The day after the harvest, we began our trip back to Manila. The group passed by a different route in order for us to see more of Ifugao. From Mayoyao, we boarded our rickety bus again for another bumpy ride deeper into the Ifugao heartland. But before we left, we stopped by a view point of the Mayoyao Rice Terraces. We left Mayoyao shortly before lunch and traveled through remote barangays of the town. We had a late lunch in Barangay Tula-ed before continuing our journey. 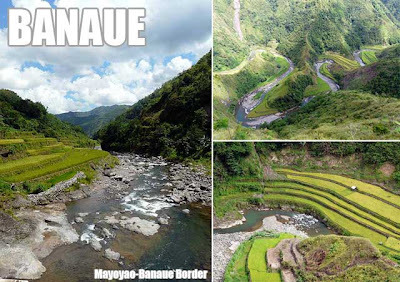 The views started getting really picturesque when we reached the bridge which connects Mayoyao and Banaue. If only we could stop at every barangay to enjoy the view. But we had a bus to catch. I especially liked Ducligan which they say was the setting for the 1996 film "Mumbaki." Another village with noteworthy terraces was Kinakin. But I was pleased to know that this Ifugao mountain road passed through the Bangaan Rice Terraces, one of the five clusters declared by UNESCO as World Heritage. It would have been great if we got to hike down the village of Bangaan. But we didn't have time to do that as well save for a few minutes to take photos. Bangaan is unique for its main village, a cluster of houses at the foot of the terraces. I saw old colored photos of the village when it was still all Ifugao houses. But like in most of Ifugao, new concrete houses have started to sprout all over. The road also passes through the jump-off point for the Batad Rice Terraces, another UNESCO-inscribed cluster. But you still have to do a lot of walking to see them. 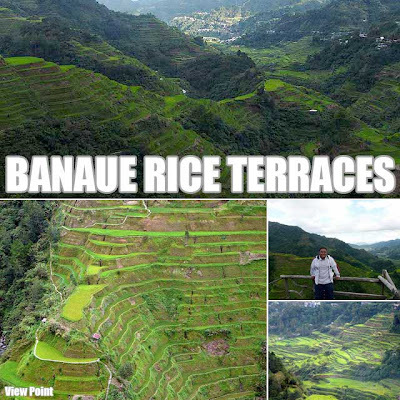 We knew we were nearing Banaue since we saw a large concentration of concrete structures from a distance. We finally arrived in town at 3:45 p.m. and went straight to the bus station to purchase our tickets back to Manila. Since the bus was going to leave at 8 p.m., we had enough time to visit the View Point area to check out the Banaue Rice Terraces. There are actually a lot of vantage points to choose from along the way. The group had a hearty dinner at the Banaue Hotel before boarding the bus for our trip back to Manila. I've already put the planting rice tour in my January calendar! Haha! May climb ako sa Saturday. Want to join? Hehe! Does this happen only once a year? coz i really want to join. thanx. i went to mayoyao May 1-9, 2009) and stayed their for about 9 days. that place is so beautiful in fact i already miss that place and I'm looking forward to visit Mayoyao again this December. I just went to Batad two weeks ago (and it was my second visit to Batad), and I am really addicted to seeing more of the UNESCO terraces. My goal is to visit all the 5 clusters listed in UNESCO. So, I still have 4 more to go - Bangaan (a tricycle ride from Banaue), Hungduan (plus Hapao), Nagacadan (in Kiangan) and Mayoyao. 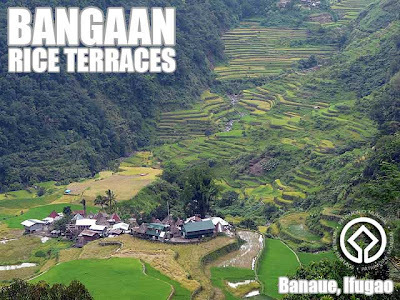 Bangaan is even further away from Banaue proper than Batad. So I doubt if you can take a tricycle. 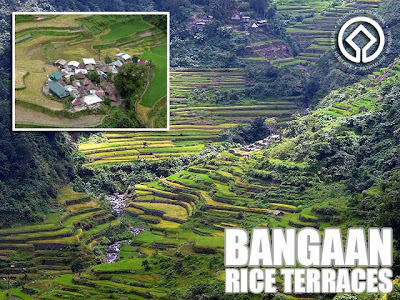 our guide said the tricycle ride from banaue can go up to the junction, and we need to hike to bangaan village for 30 minutes. roundtrip fare for the tricycle is 350 and can accommodate only 2 persons. it's 700 pesos to hapao (back and forth to banaue) but it's a bumpy ride so i'm thinking of taking a jeep ride to hapao. pano pala yung from hapao to hungduan na motor nyo? pede magrent the motor (like the habalhabal of cebu) or private yung sa inyo? I was with a group in both instances. So we were in a jeep.